Inspired by seeing some sea lions while in Oregon for a week, artist Phillip Light drew some "seal. . . maids." Just look at the personality in their faces. 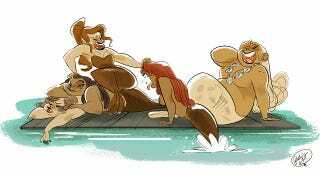 Mermaids are played out guys, and selkies are ripe for a pop culture takeover. Just compare the sheer number of appearances by mermaids in film, TV, and books to the appearances of selkies. Plus, if you had a choice, wouldn't you rather be part seal than part fish? See more of Light's work at his tumblr or get some of it at his store.